That's peak Arrieta offspeed stuff right there, and you likely whiff at those even if you're not in a Marlins uniform. The quality of that changeup is significant because Arrieta last season was pretty well abused by the opposite side (LHBs put up an OPS of more than .800 against them while striking out just 60 times against 30 unintentional walks in 317 plate appearances). A refined changeup means Arrieta could do a better job of busting the platoon advantage moving forward. In Arrieta's first start of the season he struck out six ... but he also walked six. In his second start he cuts those walks down to three ... but he struck out only one batter. Obviously, he made huge strides in his third start of the season at the command-and-control level. In terms of Game Score (a quick-and-dirty Bill James metric that measures a pitcher's dominance or lack thereof in a given start -- 50 is average and anything 90 or higher is an absolute gem), Arrieta's Friday mark of 70 is his highest since Aug. 6 of last season. On the whole, Arrieta has been somewhat disappointing since signing that three-year, $75 million pact, but the return of his swing-and-miss capacities is an encouraging sign. 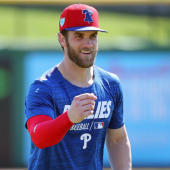 The Phillies have championship aspirations after a busy offseason and are obviously concerned about their rotation (the Madison Bumgarner rumors are proof of that), but something of an Arrieta renaissance could strike a blow against those worries. We'll see if what Arrieta flashed is sustainable or if it was just a one-off throwback abetted by one of the worst lineups in the game.